← SVPCA in Edinburgh…most spectacular of settings! The day Safari got inspired by yours truly! Remember this old painting… ? It was first released in Extreme Dinosaurs more than 13 years ago. 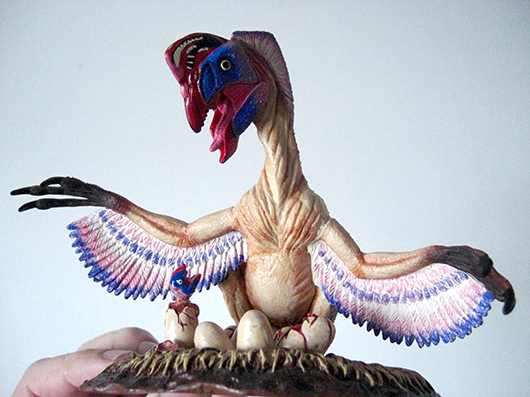 It became famous enough for something extraordinary to happen… suddenly recently suddenly it became a Safari ltd 3D miniature(Oviraptor On Nest Version 2)! 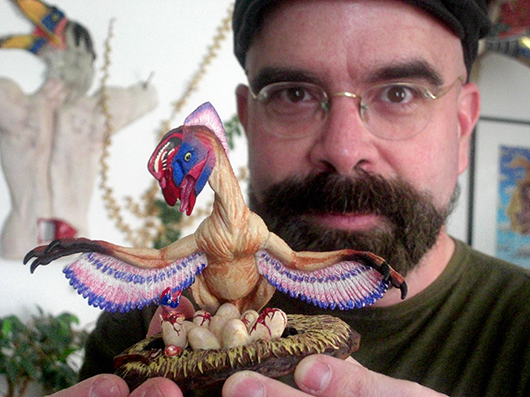 The work is so extraordinary and brought the paintings so accurately to “life” that I will be having some of these models in our booth at the coming 73rd SVP meeting in Los Angeles (last week of October this year… yes I’m going to be there!). It is interesting to note how coloration can become a signature of our own work and might be easily recognisable everywhere. Here are two other versions. But most importantly, my way of illustrating this specific oviraptors’ parental scene (Citipati to be precise) has made it to murals like the ones I have included in the Hatching The Past exhibition that is running around the world at this present time, and (as sneak preview), here’s the most recent update to the scene as revamped in this outtake for the Golden Book of Dinosaurs... soon to be released! The protagonists include Zalambdalestes and Estesia (the real egg thieves!) For me (and that is a lesson I’d like to pass to many of the devoted new paleoartists) the important thing is to be creative and original… no matter the tools, what really matters is to turn what you do into a blueprint of your own creation. You will then be recognised for what you are, not for what technique you use. 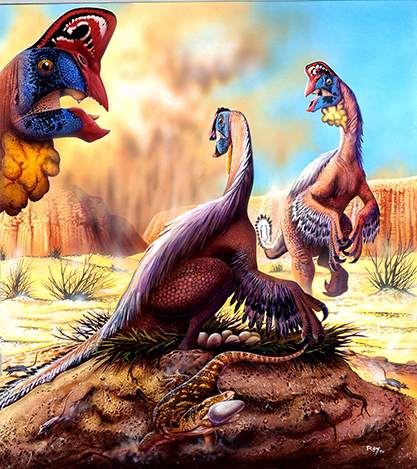 This entry was posted in Dinosaurs, oviraptorosaurs, Theropods, Uncategorized and tagged Estesia, Hatching The Past, Oviraptor, Safari ltd, SVP, The Big Golden Book of Dinosaurs, Zalambdalestes. Bookmark the permalink. 4 Responses to The day Safari got inspired by yours truly! One of your best pictures. I really like the way you depict the parental cares of the dinosaurs and the unexpectedly sand storm that comes in the background, announcing bad times for the dinosaurs. 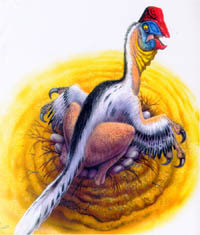 One question: Gigantoraptor would be able to sit down on his nest or due to the great size it could be unable??? Thanks. 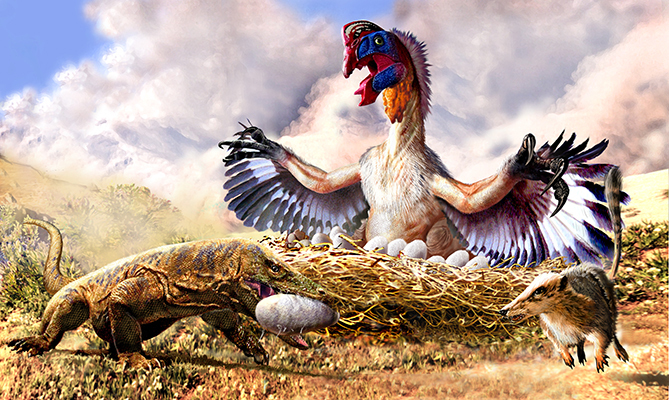 Well, I don’t see why Gigantoraptor would not have been able to sit on the nest… the nest and eggs were enormous (at least that is what the fossils are showing)! I did a restoration that is the opening illustration at my website (I might bring it over here). It seems that Oviraptorids were exceptional among dinosaurs in having eggs more or less proportional to their sizes… most (including sauropods) had really small eggs in comparison. Ok, I don’t remember the fossil record. 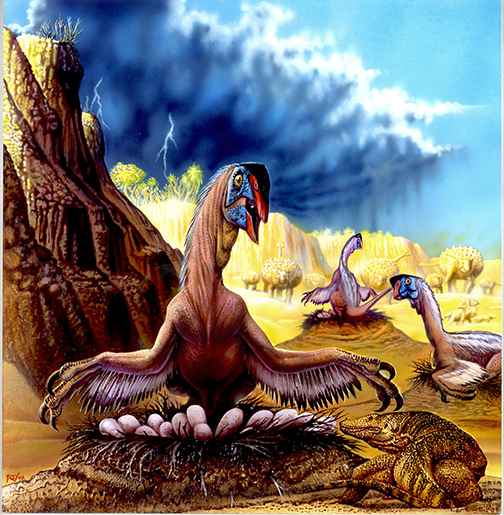 You can see a picture of the Gigantoraptor nest in my post regarding the Hatching The Past exhibition at the MUJA in Asturias Spain.